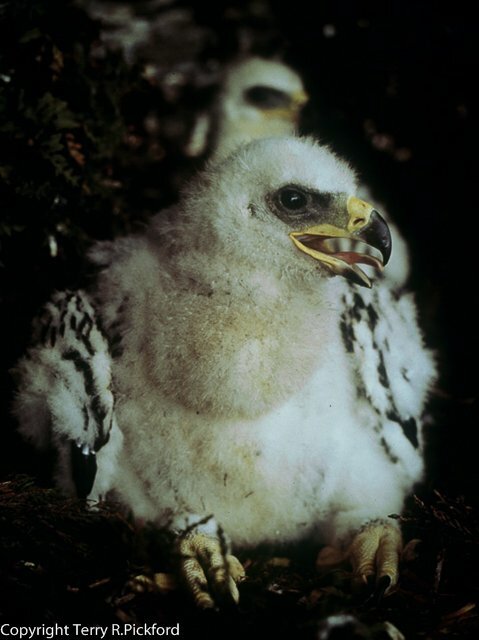 During the early 1970’s when I worked in the Scottish Highlands for a great raptor conservationist Hon.Douglas Weir, I spend many enjoyable weeks each summer tracking through the Inverness glens looking for nesting golden eagles and peregrines. The data I recorded of occupied sites found was then passed back to Doug Weir; in turn Doug Weir agreed to pay for the fuel I used during my many happy hours of peregrinations (4 shillings and six pence a gallon). 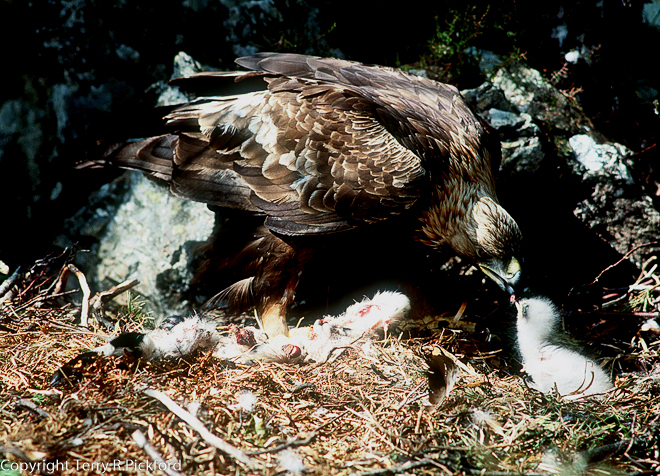 I recall the first golden eagle eyrie I ever located in June 1974 containing two 3 week old eaglets, that was a memory and experience I shall never forget for the rest of my life, forging a lifelong commitment protecting raptors both in the UK and throughout my adult life in countries abroad. The highlight of my first of many golden eagle encounters in Scotland was a truly remarkable experience. The morning was warm and sunny without a cloud in the sky. Crossing the loch alone in a rowing boat to reach the nesting site on the other side, scaling the steep rocky incline below the nesting cliff, I ended up out of breath below a waterfall tumbling down the cliff face onto the rocky boulders which encircled me. After getting my breath I began to climb up the easily accessible crag beside the cascading waterfall towards the eyrie positioned seventy feet above me constructed in a rocky crevice to my right but this side of the falls. As I climbed slowly I realised the noise of the falling water to my right masked any noise of my progress towards the eyrie. As I came level with the nest, positioned in the recess around a rocky outcrop, I steadied myself and carefully eased my head out very slowly enabling me to look carefully into the huge nest of sticks. To my astonishment, just a short distance in front of me, perhaps no more than 7 or 8 feet, I witnessed a remarkable sight, a female adult golden eagle with her back to me feeding her two chicks. Both siblings were yelping to their mother as they eagerly jostled for the food the female was presenting in her large beak. Realising I had just been witness to a very special and intimate moment, I took a deep breath steadied myself and carefully pulled my head back behind the rocky outcrop without causing any disturbance. I then carefully retracing my steps back down the cliff to my boat several hundred yards below me which I had tied to a tree by the edge of the loch. The purpose of this short story is to remind readers that iconic Scottish raptors even today in the 21st century, continue to face the peril of poison across the highlands. This is indeed a very sad and unsatisfactory state of affairs, which despite legislation appears to be out of control in many regions of the Highlands. Certainly incidents of poisoning which are recorded in Scotland rarely result in the perpetrators being brought to justice, let alone ever being caught. I would like to end my story by highlighting details of the tragic end that enveloped this particular family of golden eagles at their ancestral Invernesshire home. Before I do however it is important to point out this particular golden eagle territory, located on the North Drumochter estate alongside the A9, may have been occupied by countless generations of eagles before the death of this family tragically occurred. It is very probable many successive generations of golden eagles had raised their offspring in complete safety within this very same territory, even before Bonnie Prince Charlie visited this remote same remote glen to conceal himself and his loyal supporters following his defeat in at Culloden in 1745. In July 1992 when the same eyrie again contained twins, the adult female together with her two chicks were all discovered dead in this eyrie, poisoned after eating a carcass laced with a pesticide substance. It was suspected but never proved, the male had brought the poisoned bait into the nest. 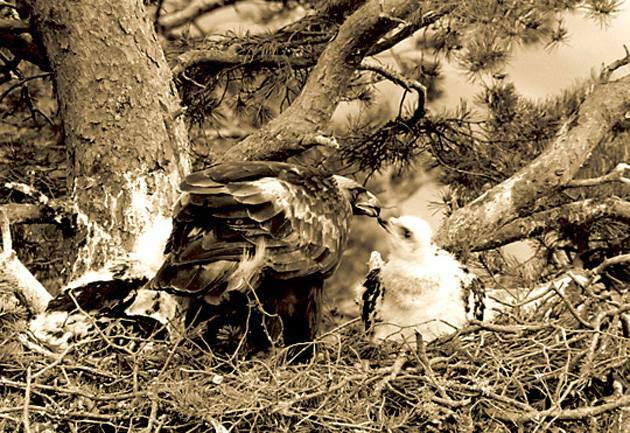 After the poisoned corpses of all three eagles were removed from the nest by the RSPB the male eagle was never seen again within the territory; he too was presumed to have succumbed to the same poison that had taken the lives of his entire family. The poisoning continues, but just how many such incidents go unreported and undetected?